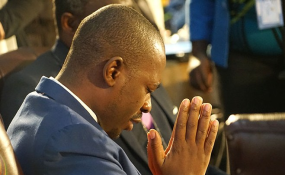 Opposition Movement for Democratic Change Alliance leader Advocate Nelson Chamisa has blasted President Emmerson Mnangagwa's call for dialogue saying it is not necessary when 'innocent' people are in prison. Delivering his speech at the National Dialogue yesterday, Chamisa said that he cannot attend a dialogue meeting when his party members are behind bars over violent shutdown protests. "All we want is this nation to unite, but we cannot have that while others are in prison on account of politics. We cannot have dialogue while others are mourning their relatives who died on account of politics," said the MDC leader. Chamisa was referring to hundreds of protesters who were arrested when violence erupted in the country following the three day stay away organised by the Zimbabwe Congress of Trade Unions (ZCTU). Chamisa also spoke on the need to remove soldiers from the streets as another pre-condition to dialogue. "We cannot have dialogue, we love our army but it should be where it is supposed to be, in the barracks, not in the streets, not in our homes," added Chamisa.